LinkedIn, the business networking site with over 60 million professionals, is taking cues from Facebook fan pages with its new Company Following capabilities. Users opting to follow a company can see updates on new hires, open positions and company profile status updates. All of this information is found on the Companies homepage, which is similar to the Facebook Newsfeed. The Companies homepage includes a search bar for finding companies to follow, a feed of recent updates for companies you follow, a list of companies that you may want to follow, a few ads served by LinkedIn, and a link to your company’s profile. 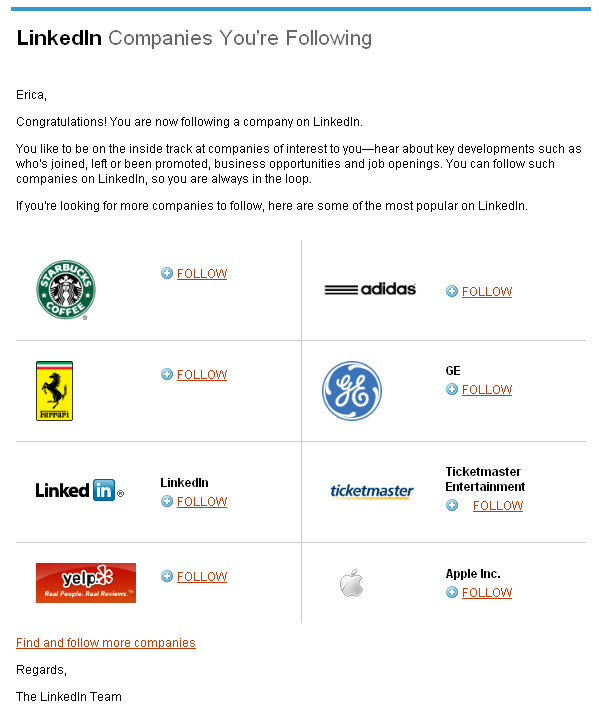 After a user opts to follow a company for the first time, LinkedIn sends an email (as pictured above) with a list of some of the most popular companies to follow, urging users to follow a few more companies. Kudos to the email marketing team on that timely delivery! April 29, 2010 in Social Media.